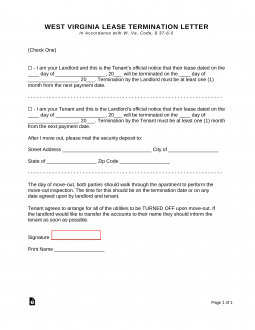 The West Virginia Lease Termination Letter Form (30-Day Notice) is a legal document that is used by either the tenant or the landlord for the purpose of serving at least 30 days notice to vacate a rental property. This document will maintain compliance to state law and most rental agreements, for either party. Landlord and tenant must arrange a date for a walk through inspection after move out.